NEW Cooperative Archives - NEW Cooperative Inc.
Hornick, IA- While the floodwaters have begun to recede, the devastation created by the massive floodwaters that it created continues to be felt by the residents of Hornick. The NEW Cooperative Foundation is pleased to present a donation of $10,000 to provide relief to the residents of Hornick. 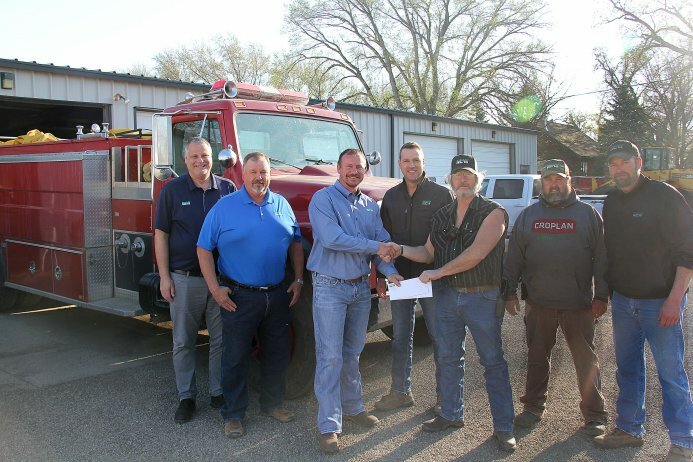 On Wednesday, April 24, 2019 NEW Cooperative board members Nick Kerr, Dan Drenkhahn, along with Jared Ehrp, Region 5 manager and Gary Moritz, representing the NEW Cooperative Foundation, CoBank and the Land O’ Lakes Foundation presented checks to members of the Hornick Fire Department in the total amount of $10,000. 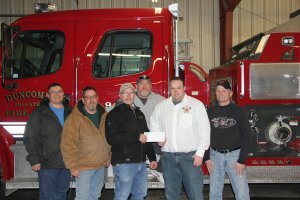 Picture from L to R: Gary Moritz, NEW Cooperative Communications Director, Dan Drenkhahn and Nick Kerr, NEW Cooperative Board members and Jared Ehrp, NEW Cooperative Region 5 Manager presenting the $10,000 donation to Curt Crichton, Hornick Volunteer Firefighters President and Matt Scheer and Ben Ronfeldt of the Hornick Fire Department. NEW Cooperative, Inc. is a farmer-owned grain, agronomy, energy and feed cooperative headquartered in Fort Dodge, Iowa. As a leading agriculture retailer, NEW Cooperative is focused on being an innovative and efficient provider of today’s agriculture markets and services to over 4,700 members throughout their 39 locations in Iowa. The NEW Cooperative Foundation is the charitable giving entity of NEW Cooperative, Inc. The Foundation is committed to investing in organizations dedicated to youth and education, human services, and civic purposes that further enhance the quality of life in our member’s local communities. 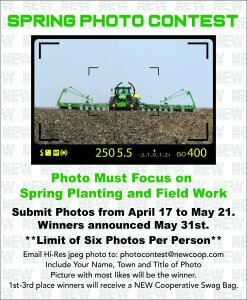 Submit your Spring Planting and/or Field Work Photos for our Spring Photo Contest. Photos will be placed on our Facebook page for voting. The picture with most likes wins! Winners announced May 31. The NEW Cooperative Foundation is pleased to present a donation to the city of Knierim for a shelter at the community park. 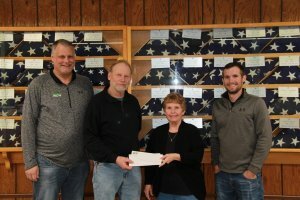 On Wednesday, March 20, 2019, Kerry Peterson, NEW Cooperative Board of Director, Rodney Brant, NEW Cooperative Region 3 Manager, and Gary Moritz, NEW Cooperative’s Communications Director representing the NEW Cooperative Foundation along with Land O’Lakes Foundation presented checks to the city of Knierim in the total amount of $4,000.00. The city of Knierim works to provide the needed facilities for residents and visitors of the community at the city park. The shelter will be beneficial to the community as it will create a place for families to hold gatherings and also provide a nice rest area for guest visiting the community. Pictured L to R: Kerry Peterson, NEW Cooperative Board of Director, Rick Jud, Mayor of Knierim and NEW Cooperative Knierim Location Manager, Rodney Brant, NEW Cooperative Region 3 Manager, and Gary Moritz, NEW Cooperative Communications Director. The NEW Cooperative Foundation is the charitable giving entity of NEW Cooperative, Inc. The Foundation is committed to investing in organizations that are dedicated to youth and education, human services, and civic purposes that further enhance the quality of life in our member’s local communities. The NEW Cooperative Foundation is pleased to present a donation to the Bode Community Club to help with the funding of a mini-park for the Bode Community. 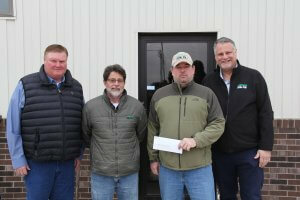 On Friday, March 15, 2019, Dyle Erickson, NEW Cooperative Board of Director, Nick Kellner, NEW Cooperative Bode Agronomy Sales Specialist, and Gary Moritz, NEW Cooperative Communications Director representing the NEW Cooperative Foundation along with Land O’ Lakes Foundation presented checks to the Bode Community Club in the total amount of $1,000.00. The Bode Community Club works to identify any needs or improvements for the town of Bode that would better the community and encourage community gatherings. The mini-park will help beautify main street and provide a nice outdoor area for members of the community to gather, relax, and visit. Pictured L to R: Gary Moritz, NEW Cooperative Communications Director, Dyle Erickson, NEW Cooperative Board of Director, Geri Wheeler, Bode Community Club, and Nick Kellner, NEW Cooperative Bode Agronomy Sales Specialist. Fort Dodge, IA – The Board of Directors and Management of NEW Cooperative are pleased to announce the expansion of our Duncombe Location. 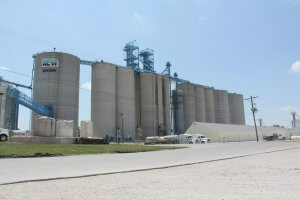 The major expansion will include a new 750,000-bushel concrete silo, an additional pit, and a 20,000 – bph leg as well. Duncombe is one of NEW’s largest grain and feed locations. Dan Dix, NEW Cooperative General Manager stated, “Duncombe’s feed mill utilizes 100% of all the corn it originates. Due to storage limitations and demand of corn at that site, corn must be hauled out of that location in the fall, only to be hauled back when space is available. The “double-hauling” is costly, inefficient, and does not make sense to NEW or the feed customer. Duncombe was the third facility to join NEW in late 1973 and has been a corner-post to NEW’s success ever since. Thank you to the area members that have allowed us to build such a long-term successful location.” NEW Cooperative expects the Duncombe expansion to be completed by harvest. Using Your Field Maps, Easy as 1, 2, 3! 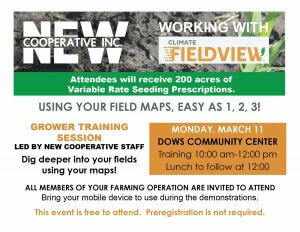 Grower Training Session will be held on Monday, March 11, 2019 by the NEW Cooperative Staff. All members of your farming operation are invited to attend. You will dig deeper into your fields using your maps! Bring your mobile device to use during the demonstrations. This event is free to attend. Pre-registration is not required. Attendees will receive 200 acres of Variable Rate Seeding Prescriptions! 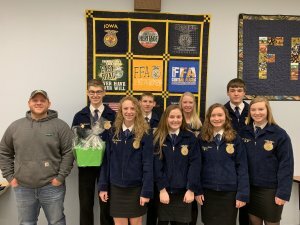 Throughout this week (February 18-21), NEW Cooperative delivered gift baskets to the area FFA Chapters in honor of National FFA Week! We hold a strong value in agriculture education because it is working toward educating the next generation of farmers. We hope each area chapter had a great FFA Week and wish you the best! 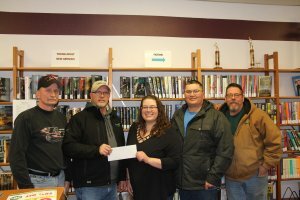 The NEW Cooperative Foundation is pleased to present a donation to the Duncombe Public Library. NEW Cooperative is proud to support our local libraries as they are dedicated to providing service to our Duncombe community. 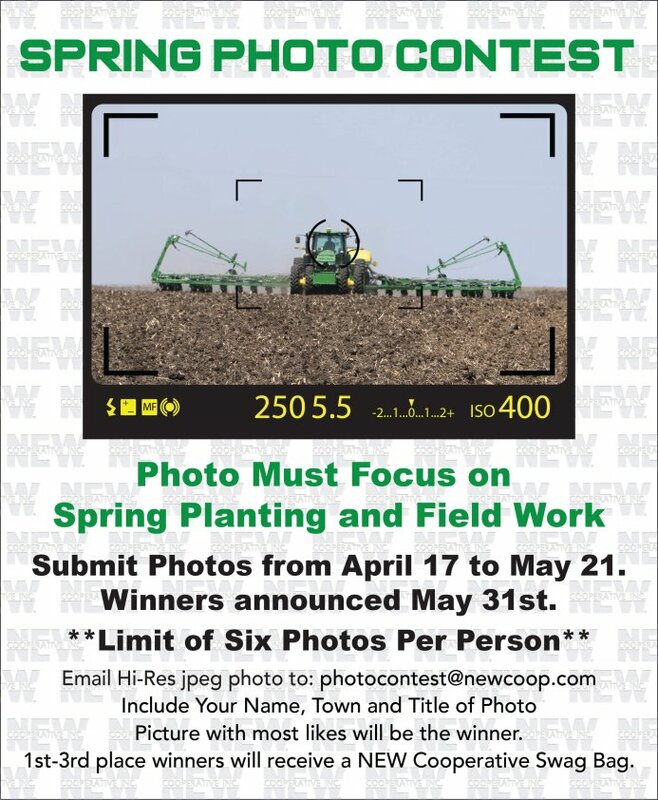 NEW Cooperative, Inc. is a farmer-owned grain, agronomy, energy and feed cooperative headquartered in Fort Dodge, Iowa. As a leading agriculture retailer, NEW Cooperative is focused on being an innovative and efficient provider of today’s agriculture markets and services to over 4,600 members throughout their 39 locations in Iowa. Picture from L to R: Eric Klien, Duncombe Public Library Board Member, Steve Daniels of NEW Cooperative, Arrin Lura, Duncombe Public Library, Dan Schmauss of NEW Cooperative, and Don Campbell of NEW Cooperative. 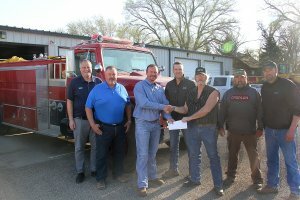 The NEW Cooperative Foundation is pleased to present a donation to the Duncombe Fire Department. NEW Cooperative is proud to support our local fire departments who are dedicated to providing their time and energy to serve our local communities. Picture from L to R: Dan Schmauss of NEW Cooperative, Don Campbell of NEW Cooperative, Steve Daniels of NEW Cooperative, Tony Ashel of Duncombe Fire Department, Todd Bingham of Duncombe Fire Department, and Eric Klien of Duncombe Fire Department. NEW Cooperative Foundation awards a minimum of five $2,000 one-year scholarships yearly to local students intending a career in agriculture while attending college full-time. An applicant should be a member of NEW Cooperative or the dependent of a NEW Cooperative member or a full-time employee. A student who has been accepted to an accredited four-year agricultural program or a two-year transferable agricultural program may submit an application. High school seniors as well as college freshmen, sophomores, or juniors are eligible to apply. Recipients are chosen by an independent selection committee. All market data provided by Barchart Market Data Solutions.